Buongiorno a tutti! Good morning everyone! I will be finishing up my first week in beautiful Firenze pretty soon, and I am having the time of my life so far! For those who don’t know, I am attending an international school this semster named after the famous patron of Renaissance art: Lorenzo de’Medici. 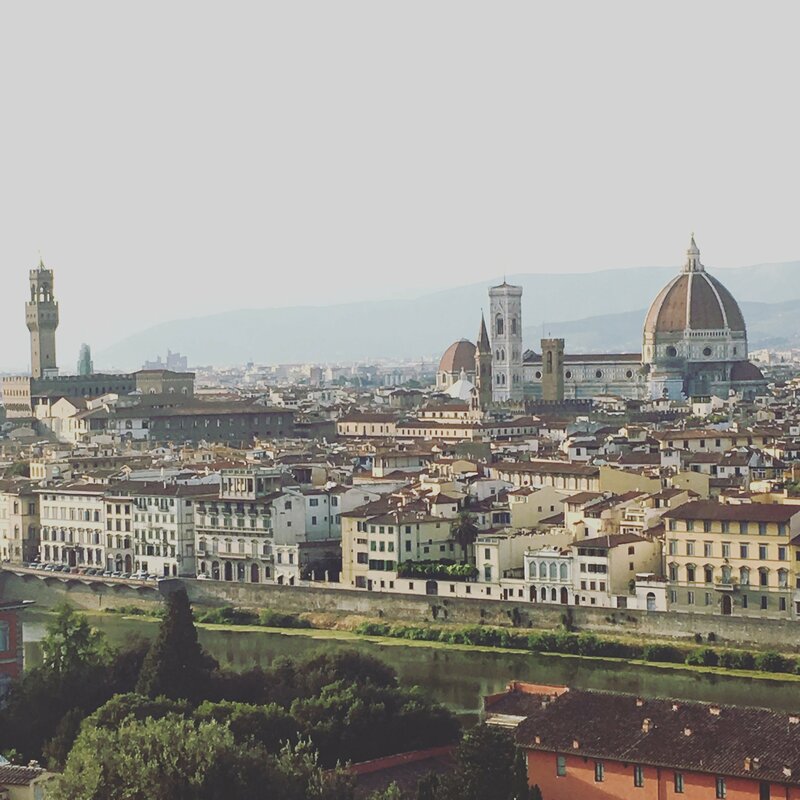 I chose Florence because I study Italian Renaissance art, and as Florence was the birthplace of the Renaissance and still boasts the largest collection of 15th and 16th century art in the world, it was an easy decision. So far this week I have been busy with travel, orientations, and getting settled in. On Tuesday I flew into Rome (hundreds of dollars cheaper than Florence) and got a train north. After checking in with my school I lugged my suitcase across cobblestone streets to my quaint little apartment on Via dei Pepi. I met my roommate, Samantha, and was excited to find out that she is majoring in Art Conservation (yay art!). On our first night we walked across the Arno river and hiked up the hill to Piazzale Michelangelo for breathtaking views of our new city (pictured first). The next three days were filled with school activities, which icluded a welcoming orientation, an advisor orientation, a student services orientation, an Italian placement test, a meet-and-greet, a city walking tour, a scavenger hunt, a travel tips seminar, a cooking class, and a student reception in the beautiful Palazzo Borghese. 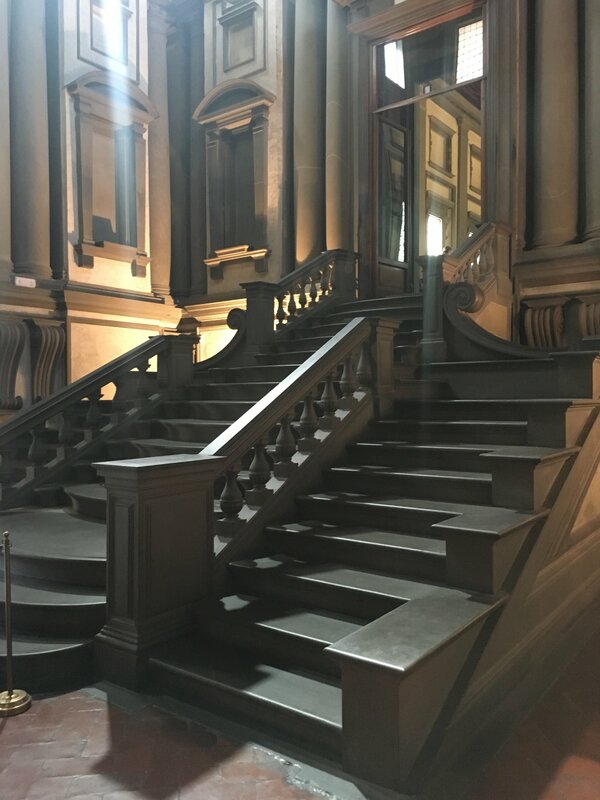 I did, however, find some free time to fit in a couple art historical destinations, such as the Laurentian Library in San Lorenzo with the vestibule, or ricetto, designed by Michelangelo himself. The room, though merely an entrance to the great library, is a tall and grand. To scale the room down to more human proportions, Michelangelo vertically divided the walls into three, with niches just slightly taller than an average person. Since the Renaissance emphasized the idea of Humanism (a movement which celebrated the human body and mind through art and study of ancient Greek and Roman philosophy) a large room heeding human proportions made sense. The idea is that when you climb the stairs to go study in the library you feel empowered and confident rather than diminished by the architecture. In this library each book had a specific place on a desk, which meant that the book never moved- you did. I was also able to go to my first museum this weekend FOR FREE because today was the first Sunday of the month, a day when all state museums are open to the public (see a list of state museums here). I chose to go to the Bargello museum first because I had never been and it is the closest to my apartment. Usually before I go to a new museum I like to do a little research to see which works of art they have, just so I don’t end up missing something while Im there. Since I woke up a little late this morning, I didn’t have time to do that. I love to plan out my visits, but not doing so turned out to be really great, since I was delightfully surprised at what I did see. Going to a new art museum as an art historian is like going to a reunion. You know the works of art so well from studying them in class or in textbooks, but then seeing them in person gives you the feeling of seeing an old friend serendipitously. For instance, on the second floor in the Bargello there were three of the Renaissance’s most famous Davids- two by Donatello and the other by Verrochio- and it was like a party with all of them there! Another blogger said she felt like saying “Oh hey, you’re here too! ?” and that’s exactly how it is. I also got to see a few of Michelangelo’s early works. One was a wooden crucifix that scholars generally attribute to the artist, but aren’t 100% sure. The other was his marble Bacchus. Carved around 1496, Michelangelo would have completed the statue in his early 20s. I’m in my early 20s. He did this when he was my age. Crazy. As the god of wine, Bacchus holds a cup high while balancing lopsided on one foot, threatening to tip over at any moment. The fawn behind him is secretly eating a few grapes while also acting as a stabilizing device for the heavy marble above. I’d say it was a pretty productive week, and I’ve just barely scratched the surface. I can’t wait to find the other Renaissance treasures! Tomorrow I start my classes, so hopefully I’ll have some better insight on the artworks I find! What a great city to land yourself in. Amazing pics too! Thank you! Yes I really love it here.